Kathleen Miao spent the summer between her freshman and sophomore years at Franklin & Marshall College hanging out on rooftops. Her internship with New York’s Brooklyn Grange, the world's largest rooftop soil farms, inspired not only her major, environmental studies (she’s also an art minor), but also her interest in urban beekeeping. Both emphasize an interconnectedness that crosses disciplines, said Miao, a New York City native. 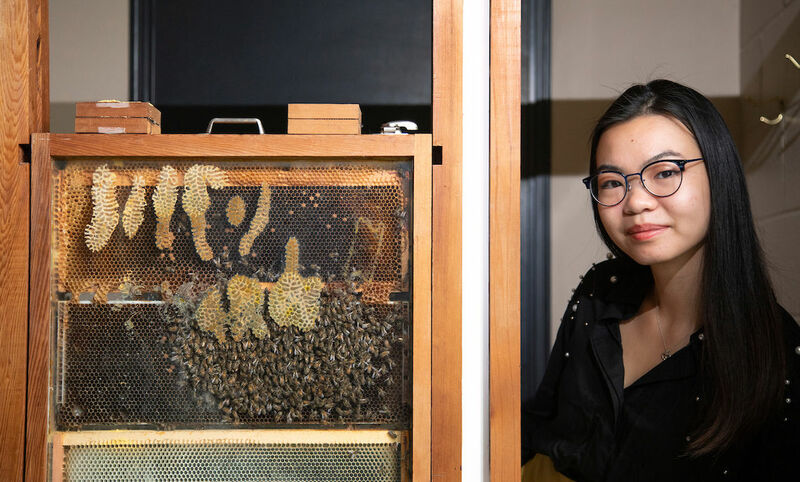 Miao’s research project, "A contemporary history of urban beekeeping in the United States," unites many topics, from women in beekeeping and governmental policy to economic status, gentrification and movements such as new agrarianism. At the center of it all – just as they are at the center of agriculture and environmental health -- are the bees. Miao, now a junior, said she entered her Brooklyn Grange internship "knowing nothing" about many of those issues she's now examined extensively. Her research this past summer under Eve Bratman, assistant professor of environmental studies, "makes me more aware of food industry issues and the importance of food security ... and, overall, making efforts to combat climate change in urban areas," she said. Miao worked with Bratman as a Humanities and Social Sciences Student Exploration Fund Scholar, researching the history of urban beekeeping. She said she learned that beehives have served many purposes beyond their occupants' powers of pollination. They've been sources of income, Miao said, pointing to documentation of an early-1900s girl making money off her beehive in Philadelphia. Beehives have indicated immigrant enclaves in cities, especially when backyard food gardens began to be seen as indicators of poverty, of homeowners who couldn't afford to shop in the fancy new supermarkets. They represented the ecological movement of the 1960s, and the 1990s resurgence of environmentalism. They're caught up in governmental policies about pesticides. And beehives were used by the juvenile justice system as a form of rehabilitation – echoing the years just after World War I, when beekeeping was encouraged as an occupation for former soldiers who'd returned from war with disabilities or shell-shock (post-traumatic stress disorder). Miao researched why urban beekeeping and hives are on the rise, and how laws have changed to accommodate the practice. She looked at how code changes that view beehives as city amenities, not nuisances, can signal gentrification – and pressure from developers for more upscale residents. Access to urban gardens, and to their accompanying beehives, "should be for everyone," not a conduit for outside change, Miao said. "That's the challenge," she said. Urban beekeeping "can be a transformative experience" that has an impact not only on the micro level of the bees, but also on the larger social and economic level.